The Scouts of the World Award (SWA) encourages a stronger involvement of young people in the development of society by making them more aware of the present world issues. It concerns global citizenship-preparation for young adults and emphasises three core-themes demanding understanding, skills and knowledge, for life on a small planet: Peace, Environment, and Development. 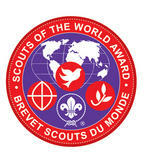 The Scouts of the World Award is an official programme of the World Organization of the Scout Movement. The programme was adopted by The Singapore Scout Association in 2006. In Singapore, it is open to everyone (Scouts and Non-Scouts) between the ages of 17 and 26 years, regardless of ability, race, faith or location.